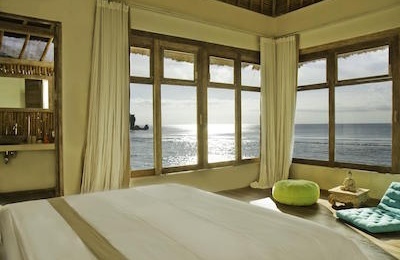 Medewi Beach Surf Resort - Bali, Medewi Guests overall rating: ★★★★★ 5 based on 3 reviews. 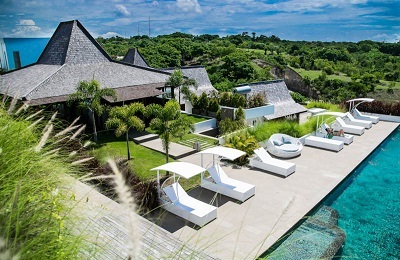 Medewi Surf Resort is a luxury front beach resort located on the west coast of Bali. A real paradise for surf and beach lovers thanks to the world-class point breaks! With to the great staff, the Surf Resort is perfectly suited for surfers, ocean fanatics who enjoy the beauty of the sport and nature. In order to full fill your needs, alternatives are possible as diving, fishing, surf, massage. As well as nature, sunset and farm tours. Everyone is welcome to be surprised by our Medewi Surf Resort, it is open all year long. View from the balcony directly to the surf break. View from the balcony directly to the surf break and pool area. Private balcony directly view to the surf break. Medewi Beach is known as a world-class break and is Bali’s internationally renowned surf spot. The break is the longest, glassy left-hander in Bali that you often have all to yourself… Which is rare in Bali! The wave offers a top variety of sizes and depending on the day conditions from beginner to decent intermediate level. Medewi’s wave is not as scary as the others reef spots and the bottom is made of boulders. Come early to avoid onshore winds! Of course, on the best surf spots of the Medewi point beach, Balian Beach and Yeh Sumbul beach. It will be a happy, a pleasant and safe stay. Fishing: Our charming local guide will take you on the beach near the surf resort for a sea tour along the coast and fishing on a traditional fishing boat. 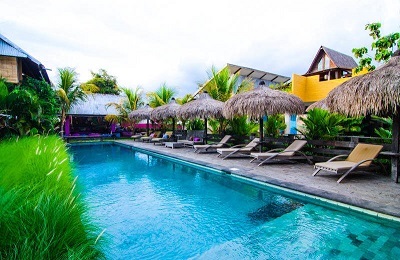 Medewi Surf Resort is on the beach, Bali’s endemic west coast. One minute to small coffee shops, restaurants and mini market, 2 hours far from the International Airport of Bali and city center of Kuta where you find big stores and restaurants. *All prices include driver, fuel, drinks in cold box. "This was just so gorgeous! The rooms are well appointed, great staff, fantastic food, best view! Absolutely worth the trip!" "Myself partner and our 2 kids stayed at the resort for a week a month ago. We had the best time! All the Staff were all so lovely and friendly and helpful and nothing was ever a problem! Food and service in the restaurant was exceptional! Rooms are beautiful clean and modern and we loved having the courtyard! We enjoyed the pool with the best view We can't wait to come back thank you all so much for a lovely stay"
"Awesome resort. Rooms are new and clean with high ceilings and beautiful stain glass windows. Loved the huge balconies overlooking the ocean. Restaurant serves amazing food and best coffee in Bali! Will be back!"